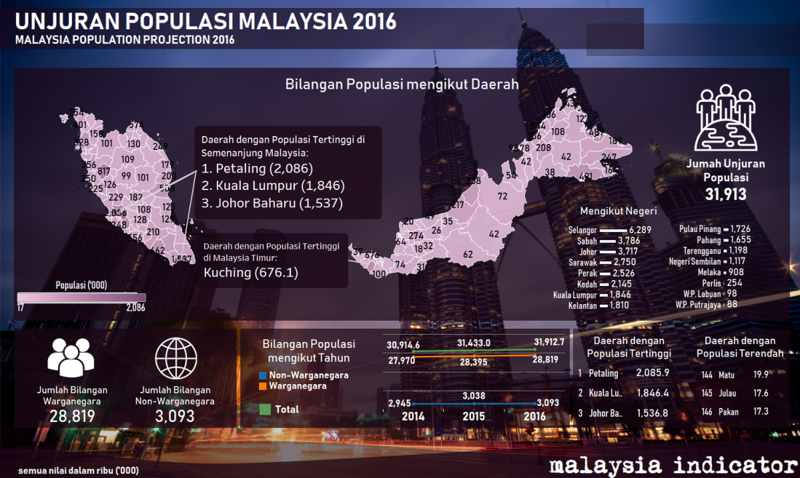 As of 2016, Malaysia’s population stands at 31,913,000, which is 998 more than in 2014. From that figure, 28,819 are citizens of Malaysia and 3,093 are non-citizens. In its Projected Population Report (revised) 2010-2040, the Statistics Department of Malaysia had said that the nation’s population is projected to rise to 41.5 million by 2040. As seen in the statistics of 2016 above, Petaling district in Selangor recorded the highest population in the Peninsular Malaysia with 2,086,000 followed by Kuala Lumpur (1,846,000) and Johor Baharu (1,537,000). Meanwhile, in the East of Malaysia, Kuching has the highest population at 676,100. Despite being the biggest state in the Peninsula, Pahang has only 1,655,000 to Selangor which houses almost 4 times of that at 6,289,000. DAP Tan Hong Pin to be ousted from Johor EXCO?